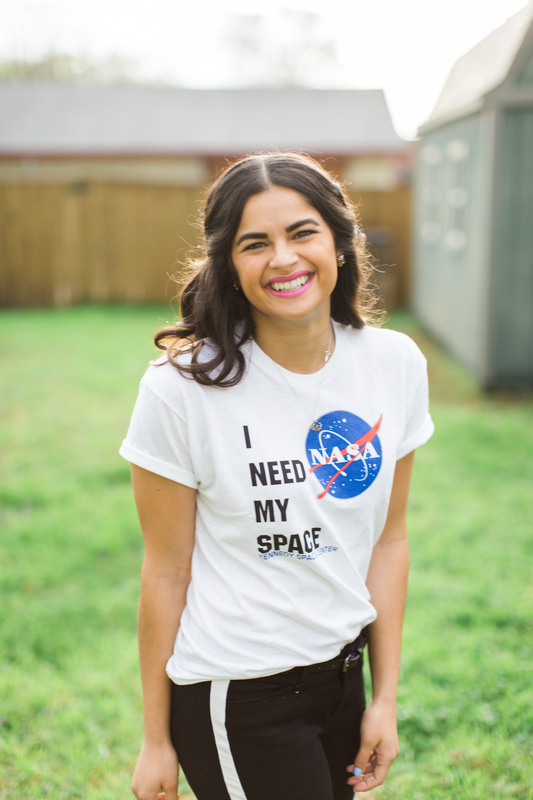 Graphic Tee Time #1: I Need My Space | Priya the Blog | life & style in Nashville & beyond! I'm so excited to be kicking off a new series with Sarah from Shades of Sarah. You probably already know that I'm obsessed with graphic tees...have always been (Graphic Tee week, anyone? ), and will always be. I love a solid or striped tee as much as the next girl, but something about a loud graphic tee appeals to the maximalist in me. The stranger, the better. 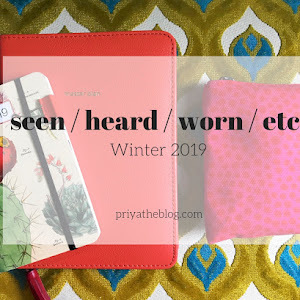 I've been sharing a LOT of graphic tee + skirt outfits on Twitter, because I can't get enough, and Sarah was kind enough to reach out about a collab. 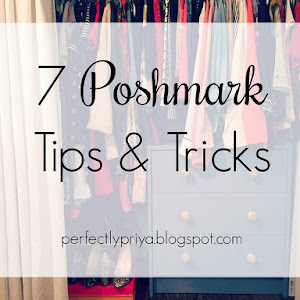 Like I needed much of a reason to wear MORE graphic tees and share them on the blog. So, curl up with a cup of Graphic Tee Time, by Sarah & I! 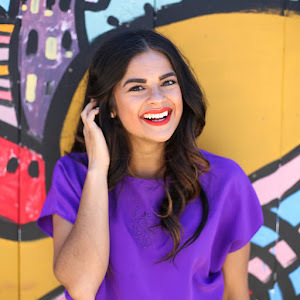 We'll be styling and sharing our favorites, right here, every Thursday in April; leading up to a grand finale on April 28th where *Y*O*U* get to link up your graphic tee 'fit too! That gives you pleeeenty of time to get your tshit and post together, so no excuses, everybody. I seriously just want you to link up because I'm always looking for more ways to wear graphic tees. Because they are in my top 10 favorite things ever. Cool? Cool. 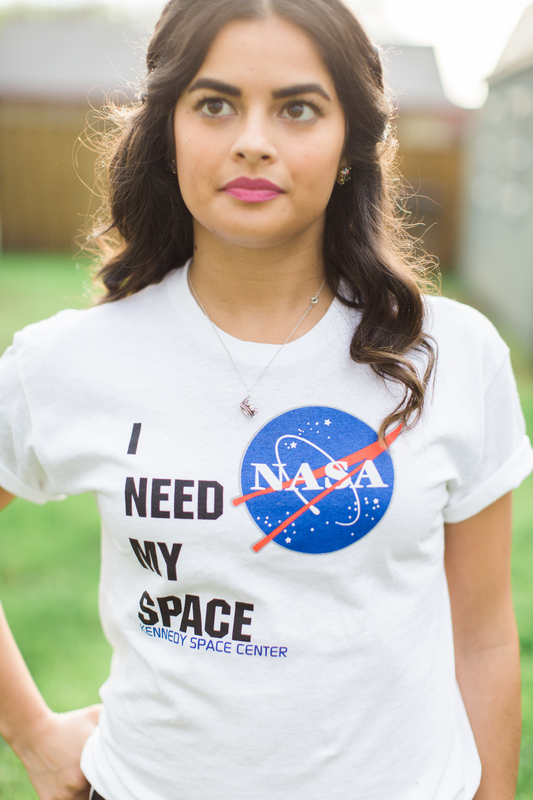 "...space is for everybody. 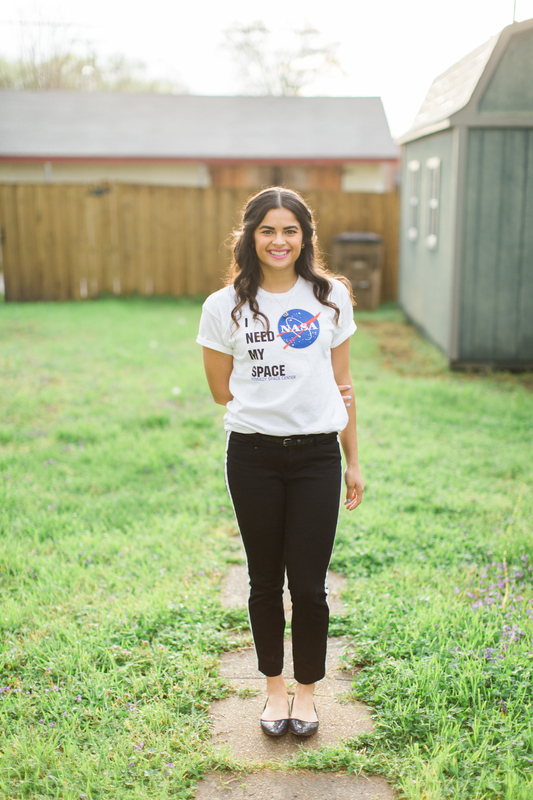 It's not just for a few people in science or math, or for a select group of astronauts. That's our new frontier out there, and it's everybody's business to know about space." 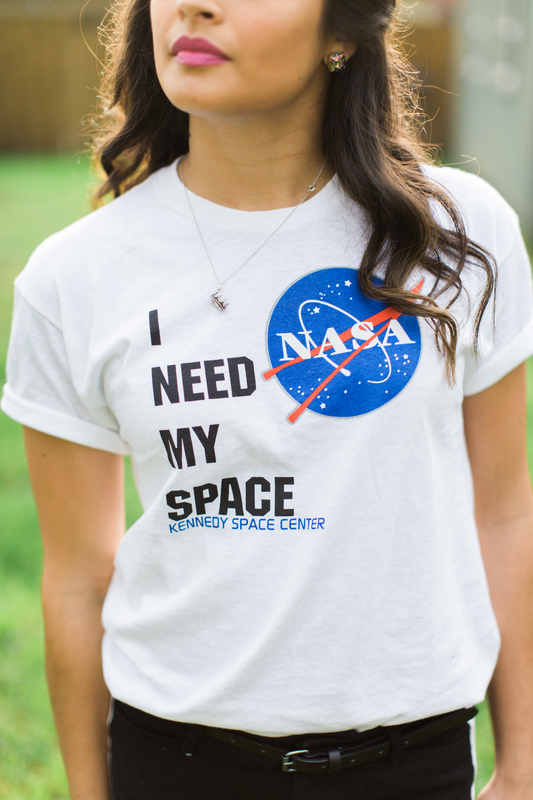 And then I realized...I need my space. So do you. And, ironically, both the literal and emotional meaning are actually PERFECT for my phase of life right now! 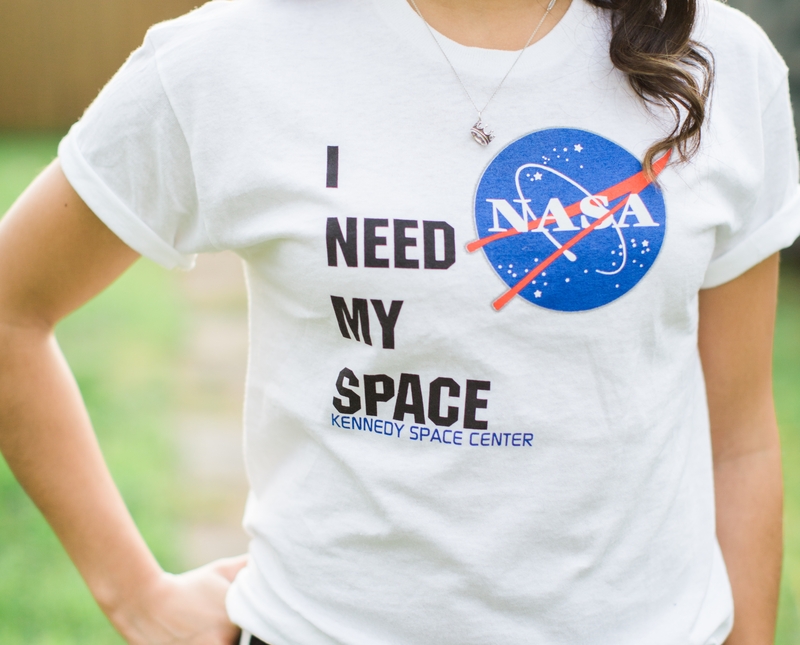 There are plenty of fantastic options for NASA tees online, this one is literally from the Kennedy Space Center online store (and a cool $10 for a kids size.) 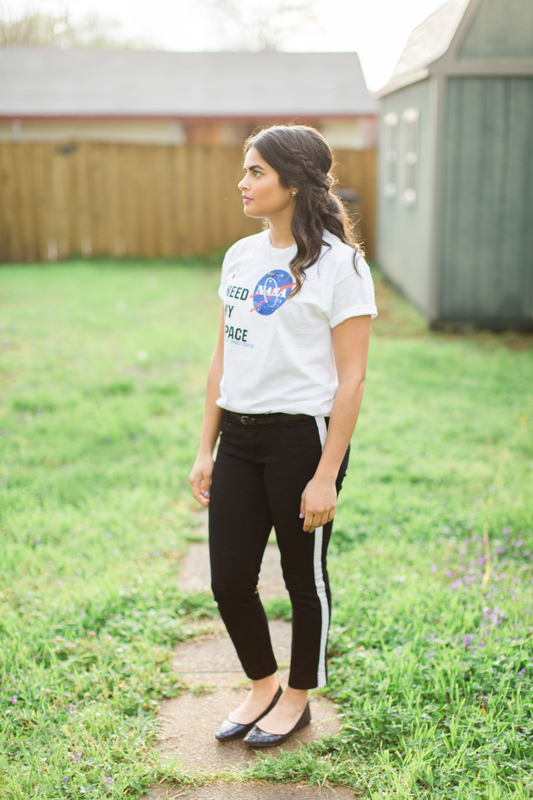 Generally my go-to for a graphic tee is tucked into a skirt, but tuxedo pants also look pretty freaking cool, as a tried and true formula. Lastly- sorry for the novel today- I had an impromptu shoot with Steph (when she was in town last week) and my dear friend Amanda, who is working on her bridal hair styling. Thanks, Amanda & Michael for letting us take over your house in a pinch! More photos by Steph to come. 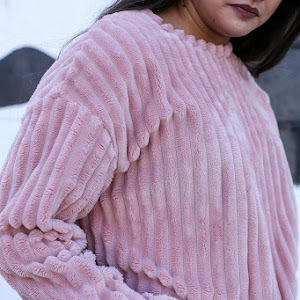 Be sure and head over to Shades of Sarah and check out what my sweet co-host is rocking today! And mark those calendars for April 28th! It will be a par-tee. Ok, I'm out. teapot graphic by my talented & sweet friend Taylor! I'm loving those pants!! 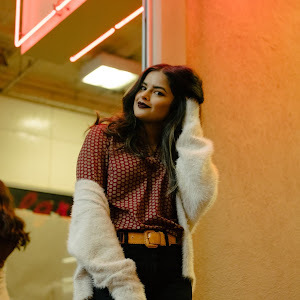 a tee and skirt sounds like a cute combo too but I love how your paired this outfit together! 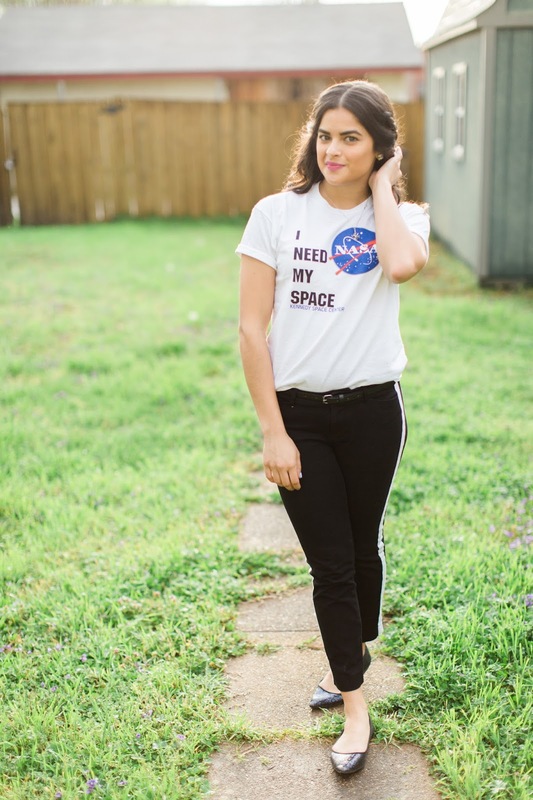 Graphic tees are so fun, and this one is so cool! Can't wait to see what t-shirt you will be rocking during this series. I thought I commented on this? Anyway, I love your tee and your working the whole look. Thanks Chelsea! I don't wear these pants nearly as often as I should.